Just last month, a new IndieGogo campaign was launched to help Don Cheadle get his gestating Miles Davis biopic off the ground. Miles Ahead only has 4 days left to meet their goal with about $90,000 left to be raised. In an effort to raise awareness and give people a taste of what's coming, Cheadle sat down with EW for an extensive interview about what is clearly a passion project about a man he has admired since a child, after becoming obsessed with Davis' album Porgy and Bess. 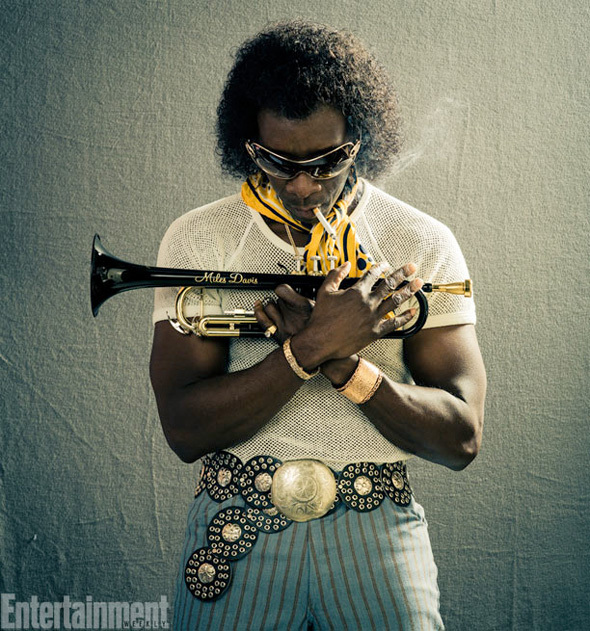 Along with the interview comes the very first image of Cheadle as Davis, complete with a gorgeous trumpet and wild wardrobe and hair. Look below! Unlike most biopics, Miles Ahead focuses on just a few of the dangerous days that the jazz icon lived throughout his career as he busted out of his silent period and led up to the recording of his 1969 jaz-rock fusion album In a Silent Way. One such focus will be the time spent with a Rolling Stone writer as they tried to steal back his music, and Ewan McGregor is on board to take that role. Michael Stuhlbarg (A Serious Man) and Emayatzy Corinealdi have also joined the film which will begin production this week in Cincinnati after nearly 10 years in development. Hopefully we see the film hit the festival circuit in 2015. That looks absolutely astonishing. I hope the film is as good as this picture. He looks quite buff for a trumpet player. Really hope this project gets all the money it needs! I backed. As a huge fan Don and an even bigger fan of miles, I would absolutely love to see this picture get made. Cheadle can really play too (see http://www.okayplayer.com/news/don-cheadle-plays-trumpet-for-miles-davis-biopic-video.html ), hopefully will add some weight to what could be an incredible performance. These are the kinds of projects that need to put in to the wild.